Neuroscience, in fact, has revealed that humans use different parts of the brain when reading from a piece of paper or from a screen. So the more you read on screens, the more your mind shifts towards “non-linear” reading — a practice that involves things like skimming a screen or having your eyes dart around a web page. Using the technology approach, the iPhone is the “school” and anyone who uses it adeptly is the master and anyone over 30 is, well, handicapped at best. New technologies enable this approach because now, hardware and software are available and production has been democratized — everyone is a producer, a collaborator, a distributor and a participant. While experiential and project-based learning is truly exciting and an important component of media literacy, it is not synonymous because the outcome of the technology approach is often limited to technical proficiency without critical autonomy. Whether using an iPad, a pencil or a videocam, pressing the right buttons is important but not enough! Elliot Rodger targeted women out of entitlement, their male partners out of jealousy, and unrelated male bystanders out of expedience. This is not ammunition for an argument that he was a misandrist at heart—it’s evidence of the horrific extent of misogyny’s cultural reach. His parents saw the digitally mediated rants and contacted his therapist and a social worker, who contacted a mental health hotline. These were the proper steps. But those who interviewed Rodger found him to be a “perfectly polite, kind and wonderful human.” They deemed his involuntary holding unnecessary and a search of his apartment unwarranted. That is, authorities defined Rodger and assessed his intentions based upon face-to-face interaction, privileging this interaction over and above a “vast digital trail.” This is digital dualism taken to its worst imaginable conclusion. In fact, in the entire 140-odd-page memoir he left behind, “My Twisted World,” documents with agonizing repetition the daily tortured minutiae of his life, and barely has any interactions with women. What it has is interactions with the symbols of women, a non-stop shuffling of imaginary worlds that women represented access to. Women weren’t objects of desire per se, they were currency. What exists in painstaking detail are the male figures in his life. The ones he meets who then reveal that they have kissed a girl, or slept with a girl, or slept with a few girls. These are the men who have what Elliot can’t have, and these are the men that he obsesses over. Women don’t merely serve as objects for Elliot. Women are the currency used to buy whatever he’s missing. Just as a dollar bill used to get you a dollar’s worth of silver, a woman is an indicator of spending power. He wants to throw this money around for other people. Bring them home to prove something to his roommates. Show the bullies who picked on him that he deserves the same things they do. There’s another, slightly more obscure recurring theme in Elliot’s manifesto: The frequency with which he discusses either his desire or attempt to throw a glass of some liquid at happy couples, particularly if the girl is a ‘beautiful tall blonde.’ […] These are the only interactions Elliot has with women: marking his territory. When we don’t know how else to say what we need, like entitled children, we scream, and the loudest scream we have is violence. Violence is not an act of expressing the inexpressible, it’s an act of expressing our frustration with the inexpressible. When we surround ourselves by closed ideology, anger and frustration and rage come to us when words can’t. Some ideologies prey on fear and hatred and shift them into symbols that all other symbols are defined by. It limits your vocabulary. 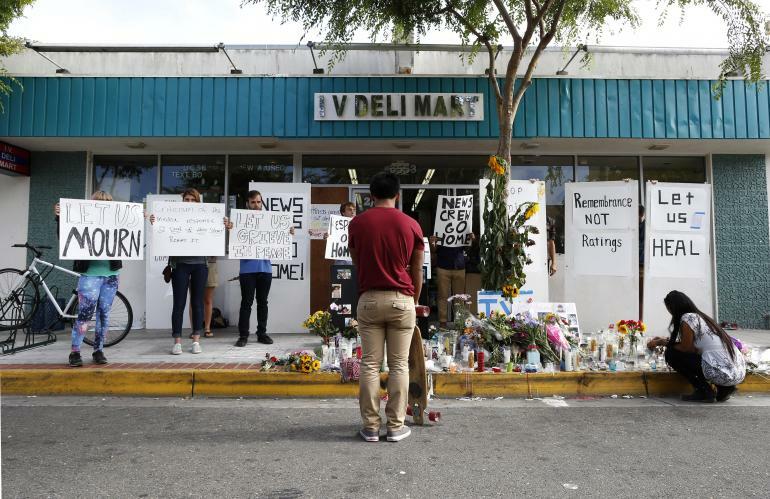 While the motivations for the shootings may vary, they have in common crises in masculinity in which young men use guns and violence to create ultra-masculine identities as part of a media spectacle that produces fame and celebrity for the shooters. Crises in masculinity are grounded in the deterioration of socio-economic possibilities for young men and are inflamed by economic troubles. Gun carnage is also encouraged in part by media that repeatedly illustrates violence as a way of responding to problems. Explosions of male rage and rampage are also embedded in the escalation of war and militarism in the United States from the long nightmare of Vietnam through the military interventions in Afghanistan and Iraq. For Debord, “spectacle” constituted the overarching concept to describe the media and consumer society, including the packaging, promotion, and display of commodities and the production and effects of all media. Using the term “media spectacle,” I am largely focusing on various forms of technologically-constructed media productions that are produced and disseminated through the so-called mass media, ranging from radio and television to the Internet and the latest wireless gadgets. Cho’s multimedia video dossier, released after the Virginia Tech shootings, showed that he was consciously creating a spectacle of terror to create a hypermasculine identity for himself and avenge himself to solve his personal crises and problems. The NIU shooter, dressed in black emerged from a curtain onto a stage and started shooting, obviously creating a spectacle of terror, although as of this moment we still do not know much about his motivations. As for the television networks, since they are profit centers in a highly competitive business, they will continue to circulate school shootings and other acts of domestic terrorism as “breaking events” and will constitute the murderers as celebrities. Some media have begun to not publicize the name of teen suicides, to attempt to deter copy-cat effects, and the media should definitely be concerned about creating celebrities out of school shooters and not sensationalize them. People have to become critical of the media scripts of hyperviolence and hypermasculinity that are projected as role models for men in the media, or that help to legitimate violence as a means to resolve personal crises or solve problems. We need critical media literacy to analyze how the media construct models of masculinities and femininities, good and evil, and become critical readers of the media who ourselves seek alternative models of identity and behavior. More than a dozen reporters were camped out on Pardall Road in front of the deli — and had been for days, their cameras and lights and gear taking up an entire lane of the street. At one point, police officers showed up to ensure that tensions did not boil over.